Contributed by: Tutor Mentor Connection, originally posted here: http://tutormentor.blogspot.com/2017/03/as-youth-grow-to-become-adults-many.html. This morning my neighbor neighbor reminded me that your success in life “is largely dependent on the parents who birthed you“. I added, “and the place where you were born“. It’s Sunday, so this is my sermon for the day. I hope those who are spiritual and may have attended faith services, will read my blog and reflect on the blessings they have and how they might share those blessings to help others who were not born to wealth, privilege and opportunity. I’ve created a variety of graphics over the past 20 years to try to show the support kids need as they grow up, and how kids in lower income areas and high poverty need help in obtaining a mix of these supports. This is one that I use often since the mid 1990s. 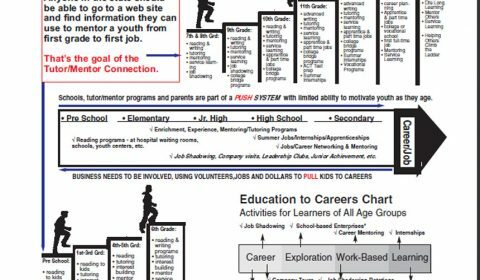 It shows the 12 years it takes to move from first grade through 12th grade, then beyond that until a young person is an adult with a job, and starting a career. At each grade level a range of supports need to be available in order to safely, and successfully, move to the next grade, and on toward an adult life. If you enlarge the graphic, and look at the arrow, you see suggestions of age appropriate supports. You also see a map of Chicago, with dark shading showing areas of high poverty. All of these areas need this type of support system. Most donors and public policy initiatives don’t provide this type of long-term support in all the places where it is needed. Is it possible to change this? I created the concept map shown below to try to illustrate this better. Note that at each age level, there are spokes showing a range of supports that need to be available to youth in every high poverty neighborhood. Because of the challenges of poverty, parents are often not able to find these supports, and communities can not offer them. 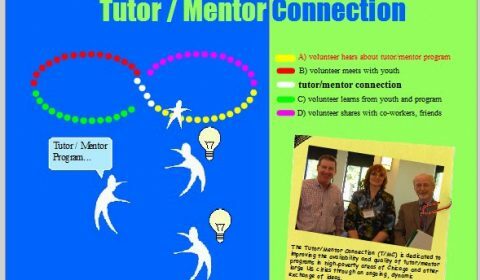 One role of organized, volunteer-based, tutor/mentor programs is to bring extra adults into the neighborhood who will help kids and families get these supports. I point to web sites of more than 200 Chicago area youth programs, and many others from around the country, and I don’t see this role discussed very often, or shown as a strategy of the organization. Here’s another concept map that shows a much broader range of youth and family supports that need to be available in every high poverty neighborhood. This map shows that kids in affluent areas face many of the same problems as do kids in poverty areas. The difference, as pointed out by Robert Putnam in his “Our Kids: The American Dream in Crisis” book (see article), is that affluent communities have more resources available to help kids overcome their challenges. And kids and families in poverty areas have unique challenges to overcome that are not normally part of affluent areas. For instance, how many kids in Winnetka worry about getting shot when they leave home and go to school or to a friend’s house? 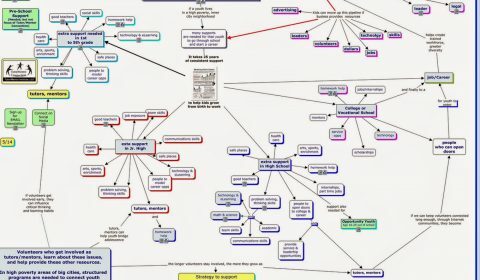 This graphic is from an animation of one of the strategy ideas I started visualizing in the early 2000s with this PDF. An intern from Hong Kong created the first version of this in 2007, then an intern from South Korea created this current version in 2010. 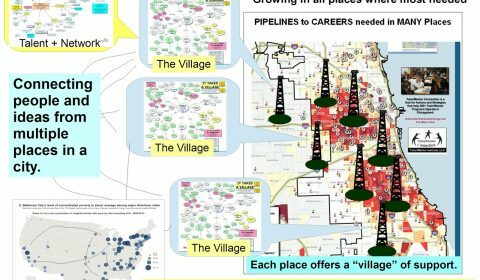 This illustrates how volunteers and students could be looking at any of the visualizations and blog articles I’ve created, then create their own version, using their own talent and creativity. This graphic was part of a blog article I wrote late last year. It emphasizes the team of support needed to help a youth grow to be an adult, or to help a single tutor/mentor program help many young people, or that a neighborhood leadership team needs to have in order to bring the supports I’m describing into a neighborhood. 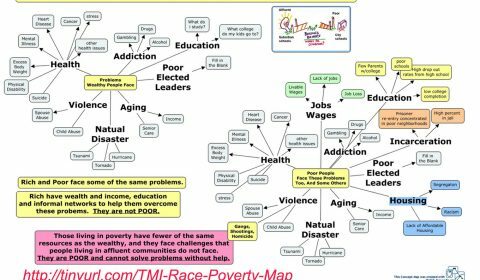 In the ‘race-poverty” map shown above each issue area requires support from many people, in many places, for many years. Somehow, through the Internet, we need to connect people working in different issue areas with each other, to talk about problems we all face, such as lack of consistent funding, and lack of talent, to support our efforts. As I write this the Federal budget proposed by the White House is cutting funding for many of these initiatives, creating an even greater competition among each sector to fight to retain their own funding. The result is greater silos of organizations who don’t work together to solve problems that are part of a great, interconnected puzzle of poverty. I met with a small group of African American leaders yesterday and shared some of my graphics via this PDF. My hope is that a few of these leaders take time to read this, and click on the links to blog articles that illustrate use of these visualizations. As they do that, my goal is that some of them write their own blog articles, and create their own versions of my graphics and stories, and share these with people in their own network so that a growing number of people begin to understand and support the strategies I’ve been sharing. Since I share my stories on the Internet, anyone in the world can read them and take on the same set of actions, even billionaires and people with great personal visibility and influence. I created the concept map shown below, to point so some people who are already doing this. There may be others doing this and I just don’t know who they are. There need to be people in every city and state in the country, and around the world, who take this role. If you’re writing stories about what you see on my blogs, or web sites, please share your link in the comments below or connect with me on Facebook, Twitter or LinkedIN. 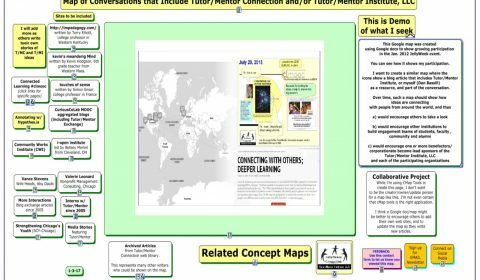 Or if you’ve been creating your own maps and graphics, focused on the same problems I focus on, and sharing them on your own blog, let’s connect. Maybe we can learn from each other, or at least, try to draw greater attention to each other.